Oh, only one in a hundred thousand is in bliss. There are tears in tens of millions of eyes. Only one laughs while ten are in tears. O! Speak Almighty God, what is this Illusion? Your Divine Play is all confusion and delusion. In 1988, when Kash was eight years old, his parents left Malaysia for Canada, the favored destination of international immigrants; a country with a history of openness and a reputation as friendly and welcoming of outsiders; a nation of incredible resources, vast geography, diverse peoples, abundant opportunities, excellent health and social services. Tolerance and social harmony are hallmarks of Canadian society, offering people the freedom to maintain and celebrate their ethnic and cultural heritage, while participating fully in Canada's economy. In this land of abundant natural wealth and beauty, generally free from racial and religious tensions, all dreams are within reach. Then in 1990 Kash's parents received Self-Realization from a Sahaja Yogi friend, Bhupinder Singh. They had agreed to try it out of courtesy, not curiosity. The first meditation was brief and midway his father got up and left. There were better things to do like guzzling cold beer and hearing Bruce Springsteen lament about life rather than sitting cross-legged and shutting out the mind. As far as he was concerned it was another empty ritual conjectured by some obscure mataji. In India, especially, bogus gurus flourish by feeding on the gullibility of their victims. Every other person seems to know some Shanti, Indrani, or Meenakshi possessing some sort of spiritual powers, the barest minimum required by imposters for some measure of success. This bogus mataji nirmala devi was no different. Then there was her funny-looking jumbo called Ganesha, a crossbreed between a human and an elephant. Ganesha might have been an ancient mammoth from the Ice Age that some primitive Dravidian tribe had somehow managed to communicate to obtain enlightenment. Kash's father was not interested in finding out if it was true. There was definitely no way he was even going to dabble in spiritual stuff for he had known strange sects that did weird rituals. But Kash's mother continued meditating intermittently for a couple of days. She told her spouse that for some reason she felt very peaceful during meditation, something she had never experienced before. He told her to continue if it made her feel better, but he was not the least interested. But eventually work and prevailing social conditions doused her enthusiasm, especially her husband's heavy drinking, loud music, wild ways and decadent desires. Soon this mataji was history. And who gives a hoot about the mysterious cool breeze he kept trying to explain? 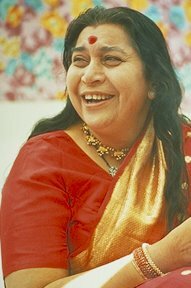 This initial Self-Realization in 1990 took place only because the Sahaja Yogi had the presence of mind not to claim that Shri Mataji was the Adi Shakti (Primordial Power). Had he done so in the beginning there was no way he would have succeeded in giving anyone in the family Self-Realization (and definitely not to his children three years later in November 1993). He would have been told with a liberal dose of sarcasm that his preposterous belief of the Adi Shakti being on Earth was based on sheer insanity. And who gives a hoot about the mysterious cool breeze he kept trying to explain? What has it got to do with enlightenment anyway? Hundreds of thousands of seekers must also have thought likewise and, after have received Self-Realization (Kundalini awakening) from Shri Mataji, just melted away again into the material wasteland. Just having some cool breeze issuing forth from their head or hands is no big deal. What type of proof was that on which to base faith on? It made so little sense. Fake gurus like Sai Baba routinely materialize diamonds and watches, remuneration more tangible and precious to ordinary humans than an invisible draft. So what made this fake Shri Mataji dare claim that she is able to raise the Kundalinis of thousands effortlessly and instantly when all others for millennia maintain that it takes countless rebirths? Just some cool breeze?!!! So what? A cool wind?!!! What has a cool wind got to do with the Spirit anyway? Who is she trying to fool? What is she trying to prove? As far as he was concerned this wind flowing from the heads and hands was actually a neat, cheap trick. And who the hell cares or knows what it is all about? within days Shri Mataji was discarded and completely forgotten, both Her photograph and Ganesha was trashed. The good life continued as usual. After a few years of materialistic pursuits and delicious indulgences in Canada, the initial euphoria wore off. There was no gold at the end of the rainbow. Kash's father had achieved his deepest desire and burning lifelong ambition to take his family to a safe haven on Earth where they could live in peace, harmony, equality and, of course, wealth. The joy of life in Canada, one of the most blessed nation on Earth, came in ever-diminishing returns. It slowly began to dawn that genuine happiness was missing in one of the wealthiest country on Earth. Life began to lose its essence. There was an incomprehensible feeling of emptiness, of nothingness, of uselessness. The realization came that life, even if cherished to the fullest, was futile if it all ended with the parting of loved ones. Existence was useless if it all ended with death. It just made no sense. In 1993 Kash's father began a journey of self-introspection to search for the meaning of life. "Why was he on Earth? What was he born for? Why is there death? Is it the end of all existence? Why are humans in a constant state of struggle for power and possessions? Why is the vast majority under constant subjugation? Why are billions striving and suffering? Why so much hate, violence and unhappiness in lands of plenty? Why so many tears, anguish and sufferings in lands of less? Why all these ceaseless confusions, delusions and illusions? Why all these religions of division, differences and hate? Why all these different Allahs, Gods and Prabhus? What is the Truth? Who knows this Truth? Where is this Truth? How to reach this Truth? After months of fruitless, frustrating searching he surrendered himself and begged the Divine to quench his ever-increasing thirst for Truth. Whoever, whatever or wherever the Supreme Creator was He, and He alone, should provide the answer. No minor godlings of the religious regimes were to answer this call. The Almighty was not called upon in the belief or hope that He was actually going to respond. It was just an act of sheer desperation, an overwhelming helplessness arising from life's emptiness, religious deception, and the physical futility of struggling to survive, only to meet eventual death and nothingness. 1. The day he drank nine and a half large bottles of extra-strength "Guinness Stout," a feat matched by few alcoholics, and awoke next day surrounded by a forest of legs. He had drunk himself senseless the previous night and awoke to find himself sprawled under a table in his friend Deva's Tulang-Tulang restaurant in Petaling Jaya, Malaysia. The legs belonged to patrons having breakfast on their way to work. His brother-in-law lay snoring nearby, his turban trailing embarrassingly a distance from his bald head. 2. The day he drank a pail of toddy (coconut wine) at Kapar Road, Klang, Malaysia, together with his four friends and then wallowed like a crazy pig in the mud as the monsoon rains fell in torrents. Hours later he found himself walking into the Copper Kettle pub in Petaling Jaya, all caked-up with mud, dirt and slime - only in a pair of jeans, minus T-shirt and shoes. They started drinking again. Feeling famished he insisted with all sincerity on being cooked and served a whole goat to satisfy his hunger and that of his four alcohol-crazed filthy friends. Somehow they kept the peace and no incident took place. They were the only patrons in the pub. After they had finally stumbled home his brother-in-law Harcharan Singh stole the limelight in this epic insanity. By just answering to the call of nature at night he won hands down because in the morning his parents found the sofas and carpet reeking of urine. His mother-in-law, who had come all the way from Seremban, was also there to witness such a crowning glory of her son-in-law. For that his brother-in-law truly deserved a standing ovation. 4. The day he took his spouse, pregnant with Kash, to visit a relative. 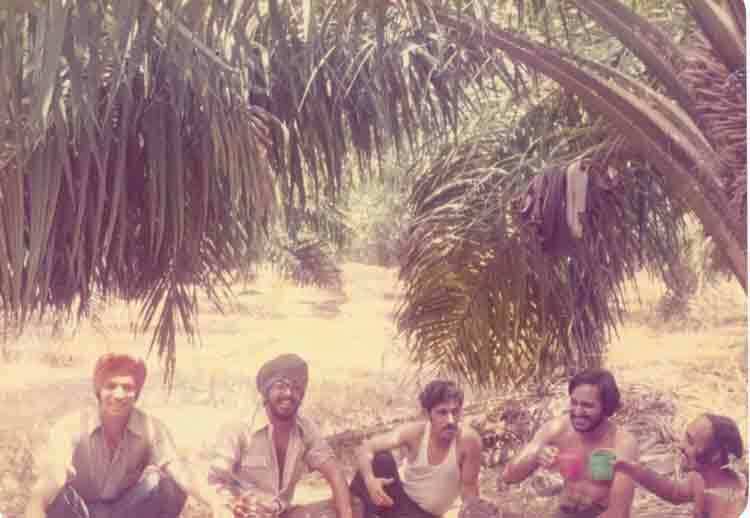 But before that he wanted to show her his favorite countryside toddy (coconut wine) spot in Kapar Road, Klang, Malaysia (see photo above). Under this convenient pretext he ended up guzzling a huge quantity of this cheap, sweet-sour fermentation. Hours later he decided to return home. As he started his motorcycle and came out of the cooling shade of the coconut estate, the hot tropical sun hit him into a senseless high. He never knew what happened until the next day. 5. That was when his spouse informed him that he had driven so recklessly that vehicles had to veer away onto the countryside road shoulders to avoid killing him. He denied having done so but found out the truth soon. He could not start his motorbike. The pistons were burnt from the sustained maximum-throttle, maximum-speed, death-defying drive! The day he drank non-stop for nearly three days without sleep. His uncle, Sukhminder Singh, arrived from India on a Sunday afternoon. They went on a drinking binge, together with his unforgettable brother-in-law, Harcharan Singh. They shifted from restaurant to pub to girlie-bar to 24-hour convenience store to sundry shop in a non-stop merrymaking of beer, wine and liquor. When there were no places left they just sat by the roadside, bottles in hands, indifferent to traffic, pedestrians and their own self-esteem. 6. They drank through Monday and finally it was Tuesday night. Only Harcharan - with head resting the cluttered table, saliva oozing from the corner of the mouth and arms slumped on both sides - was too intoxicated to continue. Uncle and nephew continued but had to finally call it quits, not because of lack of capacity but cash. They had drunk non-stop for about 55 hours. No one was bothered about families or jobs. The day he drank himself senseless in Brickfields, Kuala Lumpur, Malaysia and lost all sense of direction home. He stumbled, staggered, and groped around the area at night, completely disoriented and trying desperately to find his way home. He faintly remembered tripping and falling on something soft. After a number of furtive attempts to get up, he just collapsed and went into deep sleep. Next day the morning sun greeted him. A woman was hanging laundry on a clothesline some distance away, her face reacting as he stirred groggily to his feet. He had slept in a long-jump sandpit of a nearby school. All around humans were going about their business. The blare of horns reminded that morning rush hour was on. 7. The day he and his buddy brother-in-law drank themselves senseless at home in Jalan Aman, Kuala Lumpur. They had started before lunch on hard liquor, and by late evening were completely smashed. The highlight of this great day came when Mr. Harcharan, in a crazed stupor, fumbled for a place to empty his bloated bladder. He found a suitable spot nearby, right on his sister's dressing table. He then fell right backwards onto bed, without zipping his fly. 8. The countless times he sped on his Honda motorcycle through highways and by-ways, without headlights or through red lights, in a drunken craze of utter recklessness to life and limb. But somehow he always cheated death and lived to drink again, and again. And yet again. 9. The day he guzzled the best Swiss beer in Geneva, Switzerland and chased it down with 'speed,' till his brains went into an emergency shutdown. In the morning, he found himself freezing in some bushes in a beautiful park, without the slightest notion of how he ended there. Elegant swans glided on the weeping willow-lined lake. Well dressed Swiss, with an air of educated dignity, were strolling around. There was muted disgust at the sight of him emerging disheveled from the undergrowth and groggily struggling to just stand up. 10. The day he bought forty liters of cheap wine from a Montreal bootlegger for his 1993 birthday. He then went on an extended drinking binge at his younger brother-in-law's house in Park Extension. The next night the ambulance had to be summoned when he began having serious breathing difficulties and was slowly losing consciousness after having inhaled a killer joint (marijuana). His body began feeling cold and clammy, respiration very slow, coming at intervals and in danger of becoming unconscious. He was also trying his best not to vomit for he might choke to death in the process. This was the most life-threatening and severe alcohol poisoning and drug overdose ever experienced. In all his life he had never come so close to death. The list goes on and on. 25 years make a very, very long list. How could the Almighty Creator exist in these putrid pools of organized hypocrisy and institutionalized falsehood? Despite all this infamy and shameless decadence, Kash's father still adamantly refused to seek Him in any of His Houses of Worship. How could the Almighty Creator exist in these putrid pools of organized hypocrisy and institutionalized falsehood? Can't He be found anywhere else? Why does He force humans to seek Him only in these religious regimes professing His exclusive Grace? Which particular one, then, does He preside? What proof do the high priests of these Evening Empires have to convince the religious herd that only by exclusively praying and prostrating inside their sprawling religious ranches will God Almighty save them? How is it possible that he favored any religious regime that deny his other Messengers? No! this deity cannot be God Almighty! He has to be one of the lesser gods worshipped by existing religious tribes - a Hindu prabhu, a Jewish yahweh, a Christian god, an Islamic allah, a Buddhist buddha, a Sikh waheguru. And Kash's father would have to again continue the search for the Absolute Truth that would destroy all doubts, discrepancies, delusions, and darkness. O ek suki yaha lakoh mein. O, only one in a hundred thousand is in bliss. Ansoo hai croroh ankhoh mein. Hum neh gin gin har takdir dekhi. Kuch bhol Prabhu yeh kya Maya? For weeks the Almighty Creator was implored, amid a profusion of tears, to reveal the Truth. Again and again, and yet again He was beseeched to answer the meaning of life, creation, and this useless empty human existence. Above all, He was begged for the Truth that would destroy the falsehood that the religious regimes had deluded him and the rest of humanity. What was desired was the Absolute Truth of God Almighty, not the conflicting gods of various organized religions. Any god that could not explain and account for the other Messengers would not be God. Any yahweh that only cared for his kind would not be Yahweh. Any god that professed that salvation was available only in churches would not be God. Any allah that had only one messenger would not be Allah. Any prabhu that was found only in a single scripture would not be Prabhu. The plea for help was addressed directly to the one and only God Almighty and not to any gods of the organized religions. "When Americans pray, they best do it by retreating to their own rooms - whether a synagogue, a mosque, a temple, a church, or their own closet - and shutting the door. Religious cacophony isn't a pretty sound. Prayer in a pluralistic society is a religious tower of Babel - everyone praying to his or her own god in his or her own way. Full of sound and fury, signifying nothing. How can we hold hands and pray if we can't even agree on who we're talking to or on what terms? I once ate in a restaurant next to a large table full of noisy Christians with their pastor. The pastor's prayer was so loud and long, I was certain they were about to pass the collection plate around the room and sing a hymn after the fruit salad. What would Jesus do? Probably not that. marriage, and Paraclete by duty. 1. Robert McDermott, The Essential Aurobindo, Schocken Books, 1974, p. 15. — WHAT DO YOU MEAN BY 'PRIMORDIAL MOTHER'"? ● Why do they hate us? ● What are the Vedas? ● What is the Higher Self? ● Sages who were already ancient ... in 4000 B.C.